“This is a PDF/direct replica of the historic Mueller Report as released by the U.S. Department of Justice, Barr redactions and all, and it is essential reading for all Americans on both sides of the aisle. After almost two long years, the wait is over for one of the most important investigations in the history of American politics—the U.S. Special Counsel’s Report on the Investigation into Russian Interference in the 2016 Presidential Election, led by Robert S. Mueller. For the first time, the public will be able to see the nearly 400-page Mueller Report, which examines allegations of collusion between the Russian government and the Trump presidential campaign of 2016, as well as potential obstruction of justice by President Trump and others in regard to the investigation. “As the Russia collusion hoax hurtles toward its demise, it’s important to consider how this destructive information operation rampaged through vital American institutions for more than two years, and what can be done to stop such a damaging episode from recurring. While the hoax was fueled by a wide array of false accusations, misleading leaks of ostensibly classified information, and bad-faith investigative actions by government officials, one vital element was indispensable to the overall operation: the Steele dossier. Funded by the Hillary Clinton campaign and the Democrat National Committee, which hid their payments from disclosure by funneling them through the law firm Perkins Coie, the dossier was a collection of false and often absurd accusations of collusion between Trump associates and Russian officials. These allegations, which relied heavily on Russian sources cultivated by Christopher Steele, were spoon-fed to Trump opponents in the U.S. government, including officials in law enforcement and intelligence. The efforts to feed the dossier’s allegations into top levels of the U.S. government, particularly intelligence agencies, were championed by Steele, Fusion GPS co-founder Glenn Simpson, and various intermediaries. These allegations were given directly to the FBI and Justice Department, while similar allegations were fed into the State Department by long-time Clinton aide Sidney Blumenthal. Their efforts were remarkably effective. Officials within the FBI and DOJ, whether knowingly or unintentionally, provided essential support to the hoax conspirators, bypassing normal procedures and steering the information away from those who would view it critically. The dossier soon metastasized within the government, was cloaked in secrecy, and evaded serious scrutiny. High-ranking officials such as then-FBI general counsel James Baker and then-Associate Deputy Attorney General Bruce Ohr were among those whose actions advanced the hoax. Ohr, one of the most senior officials within the DOJ, took the unprecedented step of providing to Steele a back door into the FBI investigation. This enabled the former British spy to continue to feed information to investigators, even though he had been terminated by the FBI for leaking to the press and was no longer a valid source. Even worse, Ohr directly briefed Andrew Weissmann and Zainab Ahmad, two DOJ officials who were later assigned to special counsel Robert Mueller’s investigation. In short, the investigation was marked by glaring irregularities that would normally be deemed intolerable. Weasel Mueller use of “does not exonerate him” improper in legal context, Exonerate has exact legal meaning, Throwing bone to weasel fake news media? Speaking of weasel fake news media…. “Mr. Mueller’s team drew no conclusions about whether Mr. Trump illegally obstructed justice, Mr. Barr said, so he made his own decision. The attorney general and his deputy, Rod J. Rosenstein, determined that the special counsel’s investigators had insufficient evidence to establish that the president committed that offense. I suppose I should have led off with weasel fake news NBC. They interrupted the coverage of the golf tournament with breaking news about the Barr letter. They took the “bone” Mueller provided (exonerate) and chewed excessively on it. As soon as I heard this, I knew the Orwellian intent. This is a legal document, condensed from another legal document produced by Mueller. Exonerate has a special legal meaning. PRESIDENT TRUMP WAS NEVER ACCUSED OF OR CONVICTED OF A CRIME! I refer you to Orwell. J. Christian Adams, former Justice Department attorney, warned us in 2010. “On the day President Obama was elected, armed men wearing the black berets and jackboots of the New Black Panther Party were stationed at the entrance to a polling place in Philadelphia. They brandished a weapon and intimidated voters and poll watchers. After the election, the Justice Department brought a voter -intimidation case against the New Black Panther Party and those armed thugs. I and other Justice attorneys diligently pursued the case and obtained an entry of default after the defendants ignored the charges. Before a final judgment could be entered in May 2009, our superiors ordered us to dismiss the case. 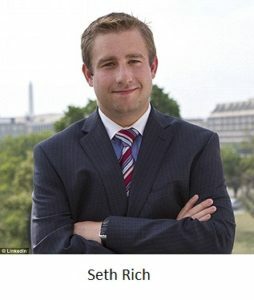 I have probably spent the greatest amount of time researching relative to reporting on the Seth Rich murder. I vowed I would not forget it. I kept looking for a followup on the Judicial Watch request. Attorney Ty Clevenger has made a number of FOIA requests as well as filing lawsuits and provided updates. “This morning I filed a Freedom of Information Act lawsuit that asks a federal judge in Brooklyn to order the FBI and U.S. Department of Justice to release records concerning the murder of former Democratic National Committee employee Seth Rich. Back in October, I wrote about the U.S. Department of Justice ordering the U.S. Attorney’s Office in D.C. to release records about the murder, but since that time not a single record has been produced. Around the same time, the FBI refused to search for records in its Washington Field Office, even though that is where the records are most likely to be found. The lawsuit notes that the FBI has a history of trying to hide records from FOIA requestors and Congress. I also asked the court to order the National Security Administration to release all of its communications with members of Congress regarding Seth Rich, Julian Assange, and Kim Dotcom, among others. As you are probably aware, Mr. Rich’s parents filed suit this week against Fox News, producer Malia Zimmerman, and frequent guest Ed Butowsky. I think that was a serious tactical error. All of the defendants now have the legal right to subpoena documents and witnesses, and you can be sure they will use that power aggressively. Why hasn’t the Justice Department been cleansed, purged? J Christian Adams and others have warned us. Rep. Trey Gowdy (R-S.C.) reviewed his questioning of Deputy Attorney General Rosenstein on Wednesday, adding that it appeared that three FBI officials were “conspiring or plotting” to decide the election. “This is a really bad fact pattern,” Gowdy said of the revelations about bias at the FBI and Justice Department. “I’m still trying to figure out why three FBI agents are discussing politics in the Deputy Director’s office, because you’re not supposed to discuss politics on federal ground and FBI agents aren’t supposed to engage in politics for Hatch Act reasons,” he added. Gowdy was referring to texts that showed FBI official Peter Strzok talking about an “insurance policy” against Trump winning the 2015 election. The text was in a trove of interactions obtained by the media and released Tuesday. Gowdy went on to say that he would be surprised if Deputy FBI Director Andrew McCabe were not fired from his position within the week. Tagged J Christain Adams warning, Trey Gowdy: appeared that three FBI officials were “conspiring or plotting” to decide 2016 election, Why aren't we cleansing Justice Dept. ?